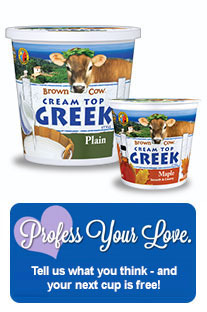 Do you love Brown Cow Cream Top Greek Yogurt? If so, be one of the first 2500 people to share a quick review on their Facebook page and get a coupon for a FREE cup of Brown Cow yogurt. Plus one lucky winner will will free Brown Cow yogurt for a year! Also, starting this weekend, Brown Cow will be hosting free sampling events at virtually every Whole Foods Market in the country as well as most California Safeways.